Iraqi interim Prime Minister Iyad Allawi has said time is running out for talks aimed at averting major conflict in the insurgent-held city of Falluja. He said after meeting tribal leaders from the area he was determined to re-establish control over the city, by military means if necessary. A few cells of former regime loyalists and 167 Islamists have been detained in recent weeks, Mr Allawi said. US forces continue to bombard Falluja and are preparing a major assault. The BBC's Claire Marshall in Baghdad says a full-scale attack now appears imminent and inevitable. Mr Allawi said negotiations were now in their final phase. "We have to restore stability in Iraq," he said. "The window for such a peaceful settlement is closing." "If there is a failure in doing this peacefully, then we will do it by force," he said. "There will be no peaceful solution with Zarqawi's people, Saddam's people, Bin Laden's people." He said a few cells of supporters of former Iraqi leader Saddam Hussein's right-hand man Izzat Ibrahim had been detained in recent weeks, among them two senior aides. 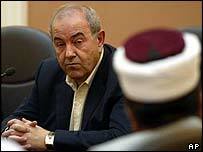 In addition, 167 Islamists - most of them foreigners from other Arab countries - had been captured, Mr Allawi said. Four of them were top associates of Jordanian militant Abu Musab al-Zarqawi. Mr Allawi insisted elections would take place on schedule in January.